Failure to secure your shipping label properly will void your insurance! If items are lost because the label fell off we will do everything possible to locate the item. Ultimately we are not responsible for loss due to improper shipping label attachment. Since our time window was short you will be printing your own labels and "self-laminating" them with clear packing tape. This is to insure they do not fall off during transit. This is important. Once you have "self-laminated" the labels securely with tape, wrap an extra layer of tape across the top of the label and then punch a hole thru it no less then 1/2 inch from the top. In the hole insert a zip-tie and then wrap it around a luggage handle. HCS will be scheduling a pick up on the agreed upon date. If you are shipping via Ground we cannot specify an exact time. It will just be sometime during the day on the date of pick up. If you are shipping air we can schedule within a 3 hour window. Generally we schedule in the morning between 9am and 12pm. You can contact us if you need to change the time. If you will not be home that day or need to leave. Please leave your luggage in a secure location where the driver can find it. If the location is not obvious please leave a note so the driver will be able to locate the items. If the pick up does not occur as you expected please feel free to contact us. We will be watching to make sure the pick up occurs as well. Wrap luggage tag (Handle wrap) around the handle of the luggage and fasten. 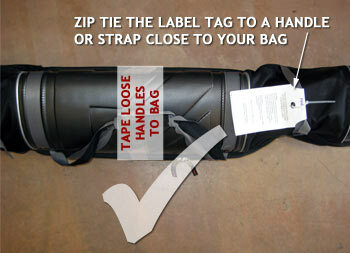 Place a zip tie through the hole in the luggage tag (Handle wrap) and around the handle. Use additional zip ties to secure zippers on luggage (if not locked). 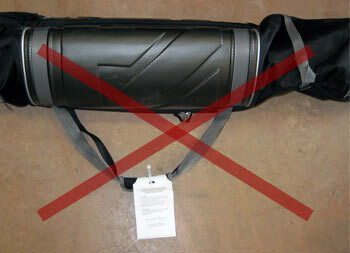 We suggest having your name and address in the luggage as well as on the outside attached to a handle. Remove shipping label from backing and place on box. If you have a paper label (email) simply tape to the box using clear packing tape. We suggest having your name and address inside the luggage as well as on the outside of the box or attached to a handle of the bag. Please verify that your shipment(s) do not contain any dangerous or regulated items listed on FedEx’s list of dangerous goods. aerosol sprays, airbags, alcohol, liquor, beer, ammunition, butane, car batteries, chemicals (some), cologne, dry ice, fireworks, gasoline, jet fuel, lighters, nail polish, nail polish remover, nitrogen-refrigerated liquid, paint and perfume. This list is subject to change without notice. If you are not sure whether an item is considered dangerous or is regulated, contact the U.S. Department of Transportation (DOT) at 800-467-4922.